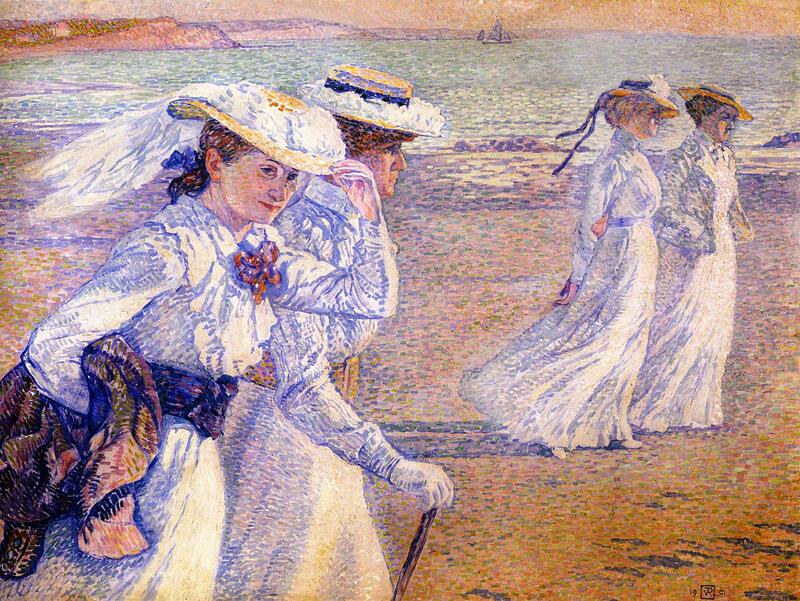 Théo van Rysselberghe (1862–1926), La Promenade (1901), oil on canvas, 97 × 130 cm, Koninklijke Musea voor Schone Kunsten van België / Musées Royaux des Beaux Arts de Belgique, Brussels, Belgium. Image by Rlbberlin, via Wikimedia Commons. Our ancestors didn’t go to the beach for pleasure, not until the eighteenth century, and many didn’t get there until the nineteenth. Until then, the only people who saw much of the beach were those who worked there: fisherfolk and their families, mainly. With the Age of Enlightenment came the notion that going to the beach, even getting into the sea, might be a healthy thing to do. Around Europe, coastal villages and towns started to see a trickle of the wealthy try this new ‘cure’. Once some places had received patronage from royalty and the nobility, the coast, its beaches, and even its waters, became more and more popular. 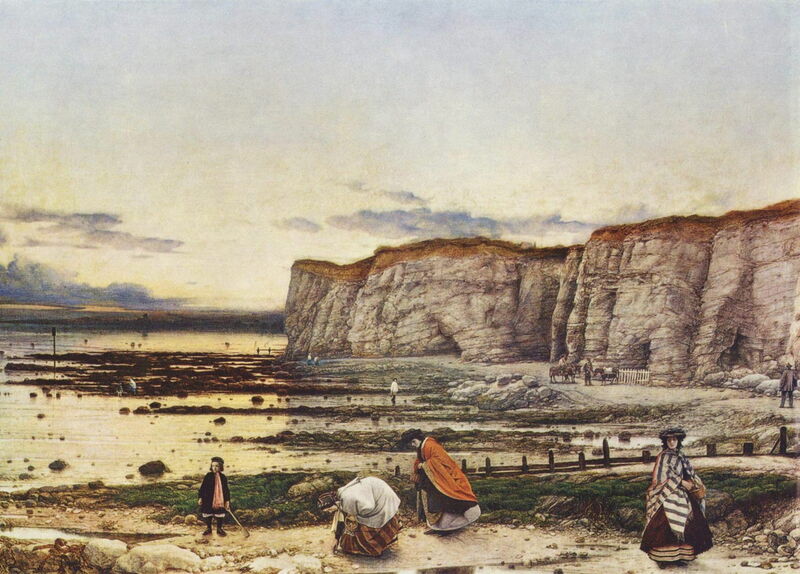 William Dyce’s finely detailed view of Pegwell Bay, Kent, on the coast of south-east England, shows a scene which despite his precise date has a certain timelessness about it. Out of season, at the end of a fine day in early October, visitors to the beach are wrapped for warmth as well as modesty. In the distance, a group of donkeys are being taken to graze for the night, after the day’s work being hired out for children to ride. In the foreground, at the left, a child holds a spade, although there is precious little sand suitable for making sandcastles. The scenes recorded by Eugène Boudin on the north French coast, on the southern side of the Channel, seem rather stranger today. 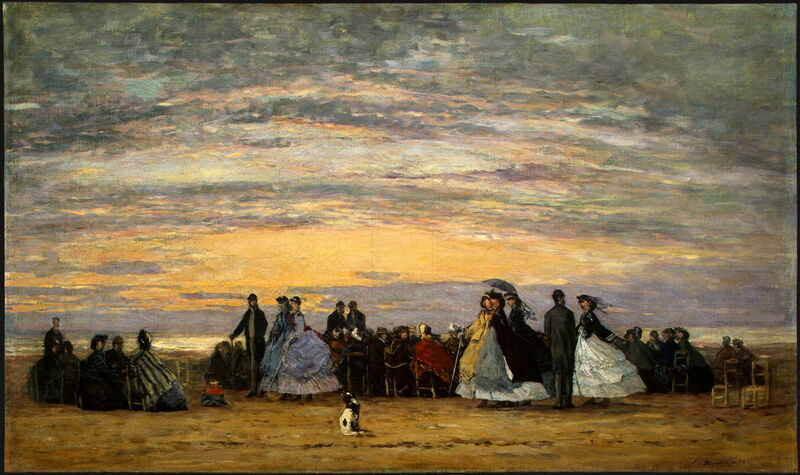 Large groups are sat together, as if waiting for an entertainment to start, as the sun sinks in Boudin’s wonderful glowing sky. In those days, dress was the problem. Until well into the twentieth century, the idea of laying bare much of the body was unconscionable. Except, it seems, when bathing in the sea. A curious double standard emerged: it had long been accepted that discreet bathing could be undertaken naked, provided that the body was immersed, and therefore not visible; but when not in the water, full dress was the norm. Bathing resorts worked around this by running wheeled huts down into the water. Fully-clothed people got in, undressed, and carefully slipped into the water at the other end of the ‘bathing machine’. Modesty was preserved, almost. Segregation of men and women on different sections of beach sometimes helped, but illustrators of the day made a steady trade from shocking depictions of the immoral antics of naked bathers. None of this applied to children, either, who were typically expected to play by and in the water unclad. 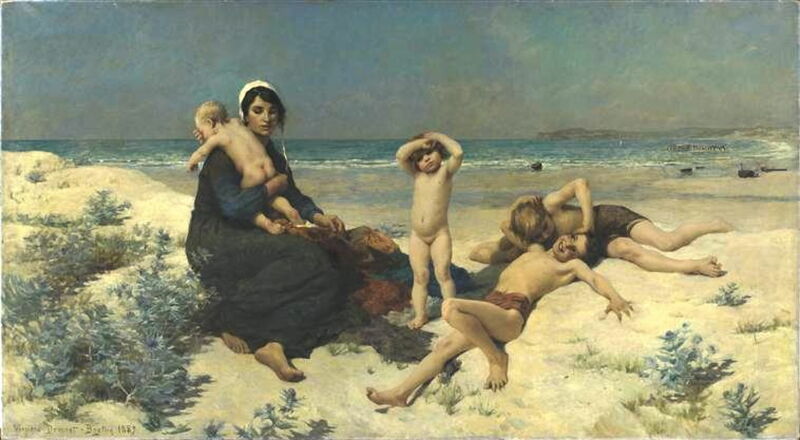 For Virginie Demont-Breton’s family, the wife and children of a fisherman further to the east along the Channel coast, fine weather was the opportunity for some fresh air, outdoor play, and a natural bath. In the middle and late nineteenth centuries, new coastal resorts opened up thanks to rapid and reliable connections by railway to the growing industrial cities. Spas and select towns started to experience huge migrations of middle and working class people, and catered for those who worked for the affluent, as well as the rich themselves. Sleepy fishing villages along the Mediterranean coast of France were rapidly opened up to the outside world, as the rich built holiday villas, and passed their evenings in new casinos and bars. 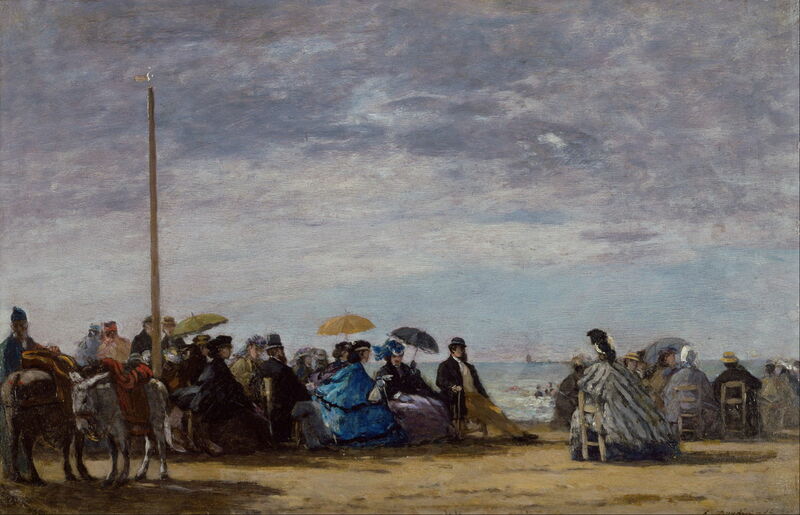 Édouard Manet (1832–1883), On the Beach (1873), oil on canvas, 95 x 73 cm, Musée d’Orsay, Paris. Wikimedia Commons. 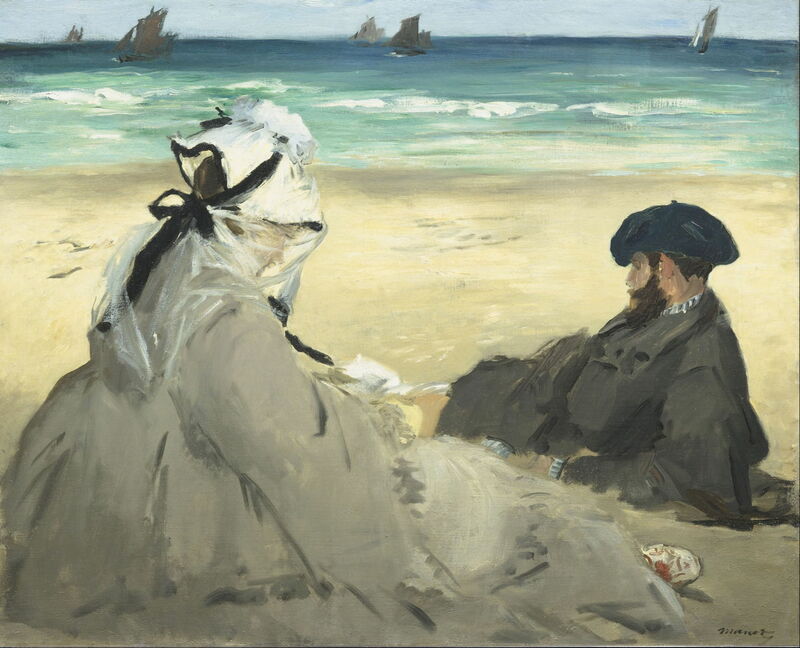 Time spent on the beach was often just spent looking, as in Manet’s On the Beach (1873), watching out to sea where numerous small fishing boats were busy at work. 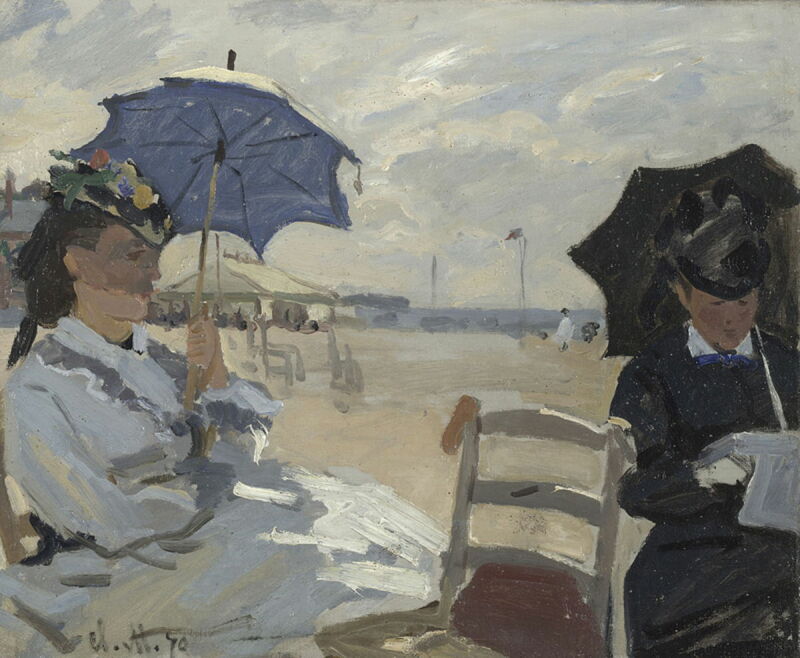 Claude Monet’s The Beach at Trouville (1870) shows a typical scene on the Normandy coast, parasols deployed to provide shade from the sun. Monet, of course, was greatly influenced in his early paintings by Boudin’s beach scenes, and his early Impressionist style first became apparent in some of his paintings of the coast, including the series of five which he made at Trouville. The woman seen at the left here is Monet’s first wife, Camille, and the woman on the right is thought to be Boudin’s wife. This is also one of the best-attested plein air oil paintings in the Impressionist canon: grains of sand from the beach are locked in its paint layer. Beaches were now attracting visitors around the world. 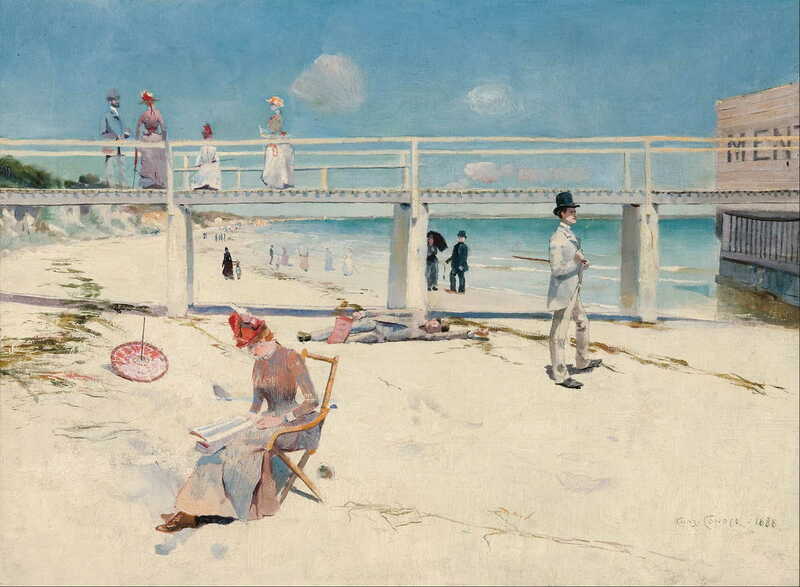 Charles Conder’s view of the beach at Mentone shows the range of activities of those who have travelled the short distance from nearby Melbourne, Australia. Conder was one of the small group of painters who changed Australian art when they started working in Impressionist style. 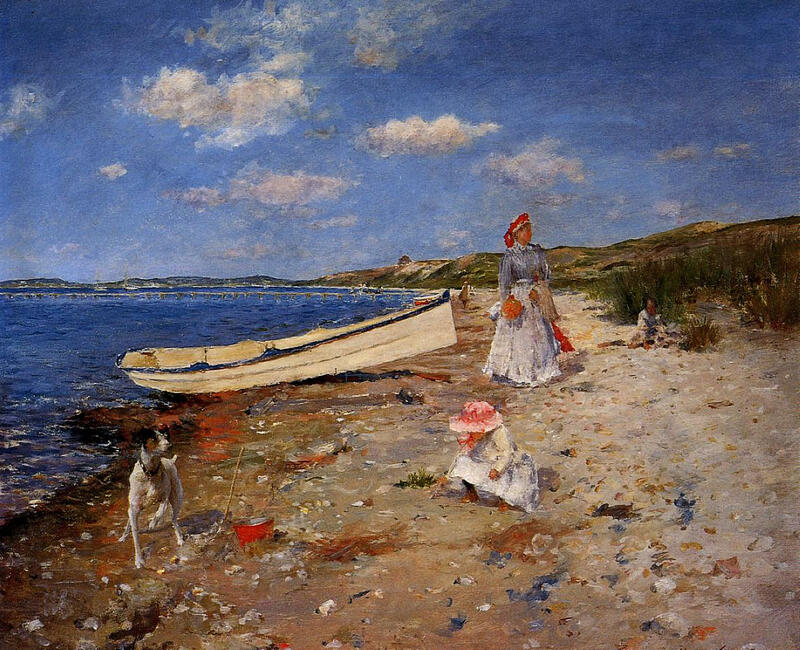 The citizens of New York often went to the beaches of Long Island, NY, although here William Merritt Chase has travelled far from the crowds, out among the Hamptons, where the more affluent were building their holiday mansions. Chase was a key figure in American art in the late nineteenth century: trained in Europe, he adopted an Impressionist style and for many years ran a large and influential summer school in this part of Long Island, teaching plein air painting. 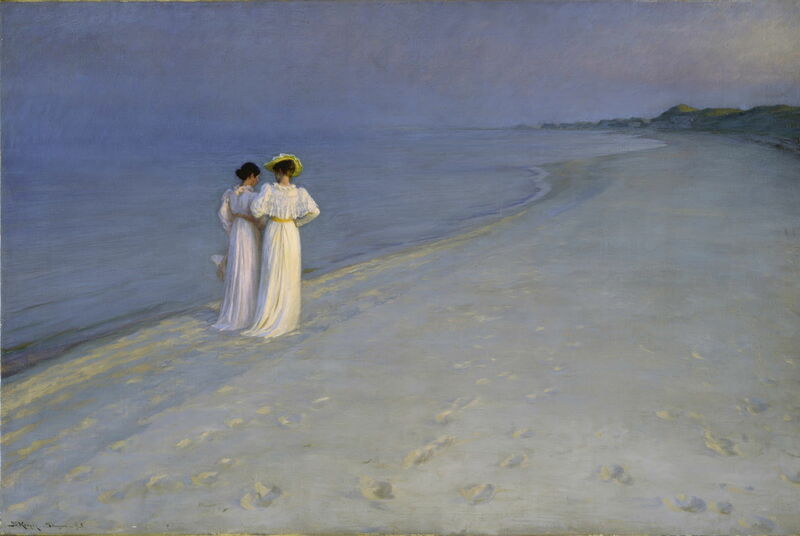 Peder Severin Krøyer (1851–1909), Summer Evening on Skagen’s Southern Beach (1893), oil on canvas, 100 × 150 cm, Skagens Museum, Skagen, Denmark. Wikimedia Commons. Just as French Impressionism was born on the beaches of northern France, so the movement spread around the world on its sand coasts, under the warm light of the sun. Danish Impressionists like Peder Severin Krøyer gathered to enjoy a Summer Evening on Skagen’s Southern Beach (1893): one of a series of similar views painted by Krøyer on this remote strand at the northern tip of Jylland (Jutland), the northermost part of Denmark. Théo van Rysselberghe’s Divisionist La Promenade (1901) captures the rich light of one of the beaches in the south of France. These now hosted the new generation of artists who progressed from Impressionism towards the modernism of the twentieth century. With the new century came a new accommodation between fashion and modesty: the progressive adoption of clothes designed for wear when bathing, and on the beach. 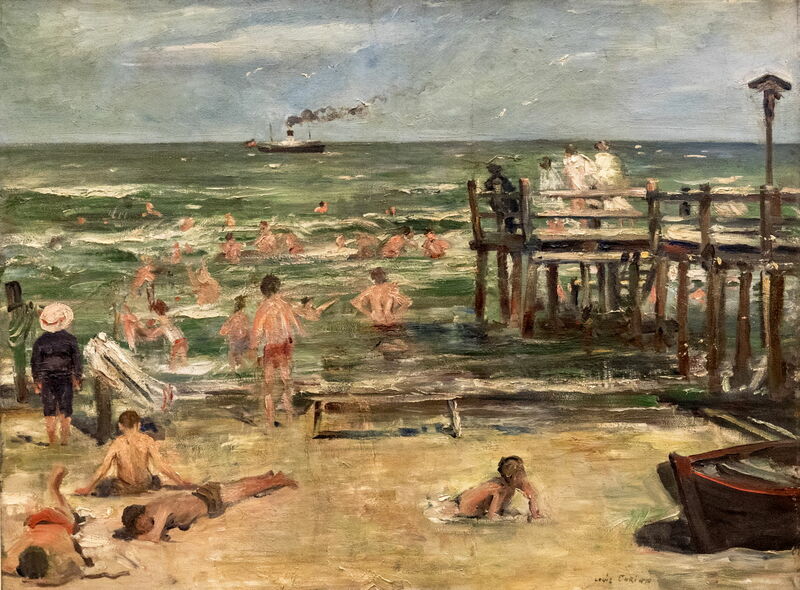 In Lovis Corinth’s view of Swimming in Horst – Ostsee (1902), the more bracing waters of the Baltic are proving popular with these men in their bathing trunks. 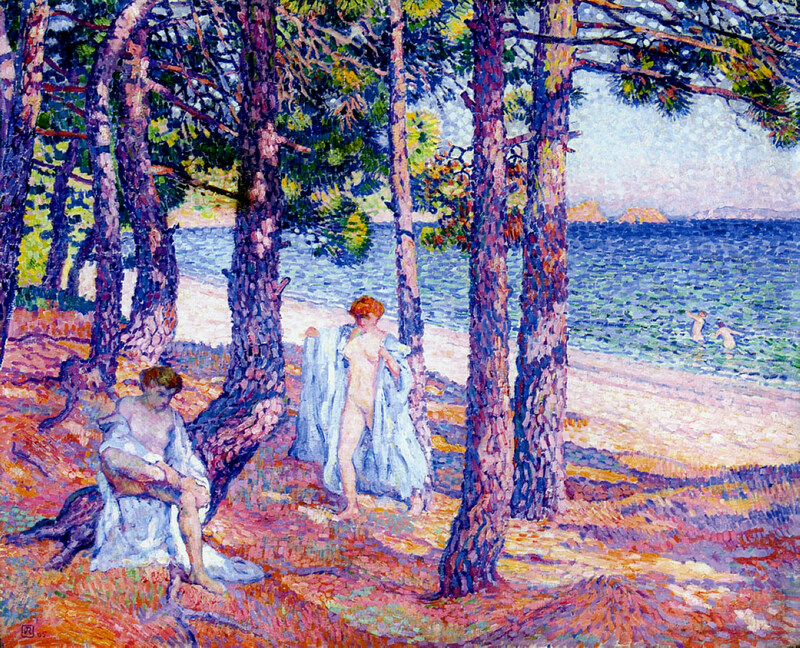 In Théo van Rysselberghe’s more secluded Bathers under the Pines at Cavalière (1905), though, these young women were able to follow the older tradition and go naked. This beach has changed enormously over the last century too: this area has become a very popular resort at Lavandou, near Saint-Tropez. 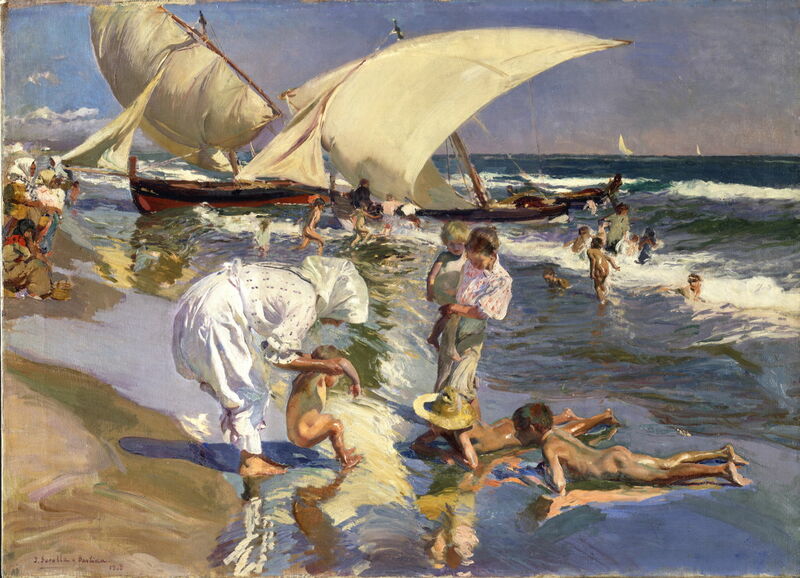 Joaquín Sorolla (1863–1923), Beach of Valencia by Morning Light (1908), further details not known. Wikimedia Commons. For the more traditional families in eastern Spain, there had been little relaxation in dress in spite of increasing visits to the beach. 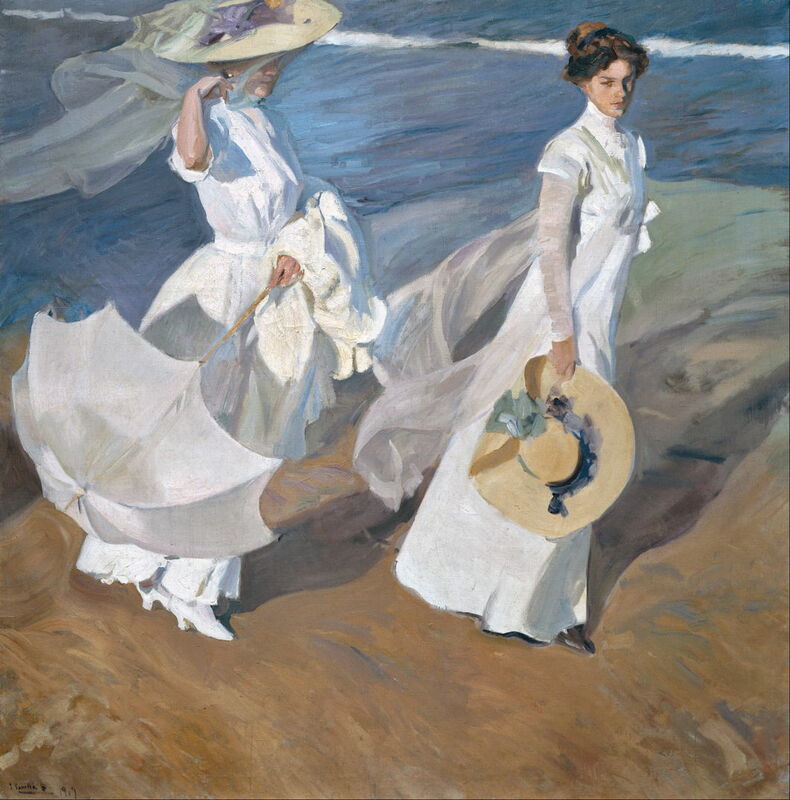 Joaquín Sorolla’s Beach of Valencia by Morning Light (1908) shows mothers still modestly-clad, even with their heads covered. 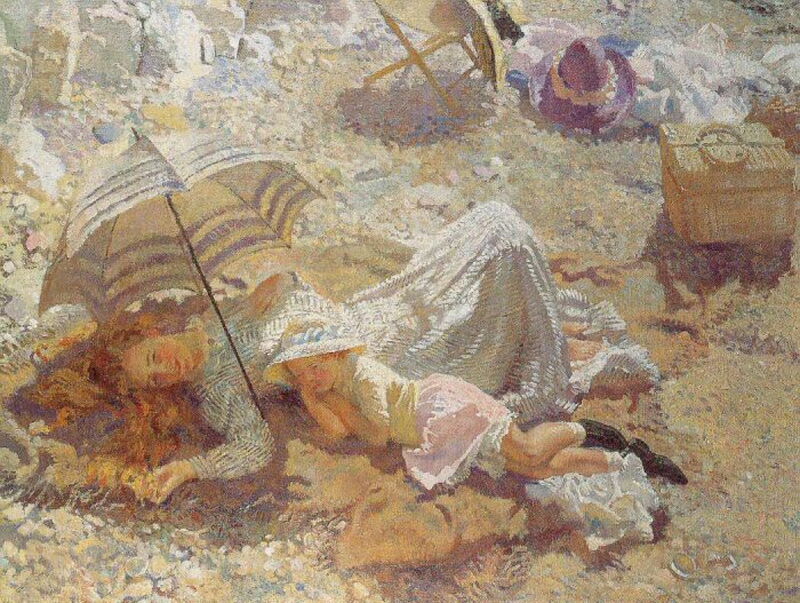 William Orpen’s Midday on the Beach (1910) captures the pre-war day out: lighter-weight fabrics, parasols, and a large wicker hamper containing a packed lunch. Finally, in the early twentieth century, we see a more recognisably modern beach scene, on Good Harbor Beach in Gloucester, MA. 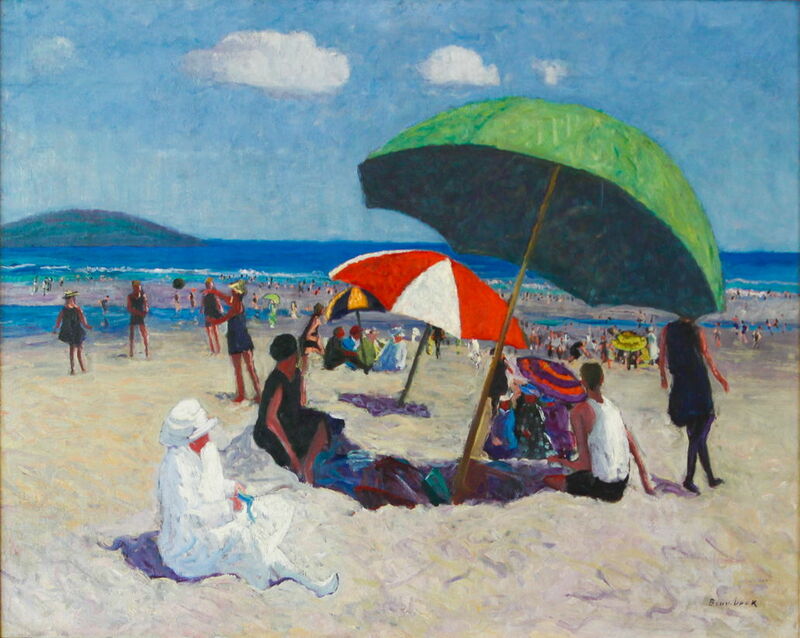 Adults are now wearing light clothing which exposes their arms and legs, taking the shade beneath large brightly-coloured beach umbrellas. This is reflected well in Louise Upton Brumback’s bold and crisp style. Those down in the water wear bathing costumes, and there’s not a coat in sight. I hope that wherever you are, you’re enjoying the same. Posted in General, Life, Painting and tagged Boudin, Brumback, Chase, Conder, Corinth, Demont-Breton, Dyce, Krøyer, landscape, Manet, Monet, Orpen, painting, Sorolla, van Rysselberghe. Bookmark the permalink.